Before you purchase a new furnace or other home heating system, make sure to use a BTU heating calculator to correctly determine the size of heating system needed for your home. BTU stands for British Thermal Unit and refers to the output of energy from heating and cooling systems. When it's time to purchase a new furnace or central air conditioning system, you'll be faced with deciding between units that measure varying amounts of BTUs. A general rule of thumb is the more BTUs being put out, the more space the unit will cover. This may sound simple, and many people assume that you should simply purchase the unit with the highest number of BTUs that you can afford, but this is actually incorrect. The more BTUs a system uses, the higher your energy costs will be. Even high efficiency units can be overused, meaning they are pumping out more BTUs than your space truly requires. For this reason, the BTU heating calculator exists. What Is the BTU Heating Calculator? This heating calculator for BTUs is the formula you should use to determine exactly how many BTUs your furnace should put out for a given space. It takes into account the size of the room, how well insulated it is and the difference in temperature from what it is outside and what you would like it to be inside. The final number given should correspond to the heating appliances available; round up to the nearest unit for the best heating coverage. With just a little time spent measuring and checking your insulation, it is possible to quickly and easily calculate the number of BTUs you need for your home. Take the measurement of the rooms to be heated in length and width and multiply those numbers together. This is the number of square feet you will be heating. Multiply this number by the height of the walls to find the room's total cubic feet. Measure the length and width of all the windows, doors, outside walls and the roof of the home. Multiply to the get the square footage of each of these items. Determine as closely as possible what the R-factor, or insulation rating for each of these items is. An R-factor reference sheet can help you determine your home's R-factor. Multiply the square footage of each of your windows, doors, outside walls and the roof by each item's R-factor. Add these numbers together to get the amount of heat loss in the home. Calculate the difference in outside temperature to inside temperature. While these factors can continuously change, try to get the average outside temperature on the coldest part of the year, and your optimal indoor temperature when you are home. Subtract the outside temperature from the inside temperature to get the difference. Find the number of temperature changes in the home per hour. Does the temperature rise or fall dramatically in this time span? Divide your cubic feet by the number of air changes per hour. Multiply this number by .019 to get the amount of heat loss per hour. Add this number to your indoor/outdoor temperature difference to get the total amount of heat loss. Multiply your heat loss by the temperature difference to get the number of BTUs per hour needed to warm the space. 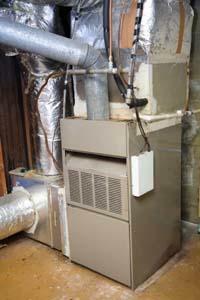 Round to the nearest full BTU to find the correct furnace or heating system size for your home. The BTU heating calculator can help you save a lot of money. Too small a furnace will need to work overtime to compensate, while one that's too large will be outputting more energy than is required. Use this calculation before your next purchase to ensure the correct sized heating system is installed.